The gods of Tamriel tend to take a pretty hands-off approach when it comes to player characters, but there’s a new mod that aims to make religion in Skyrim a much more active way of life. 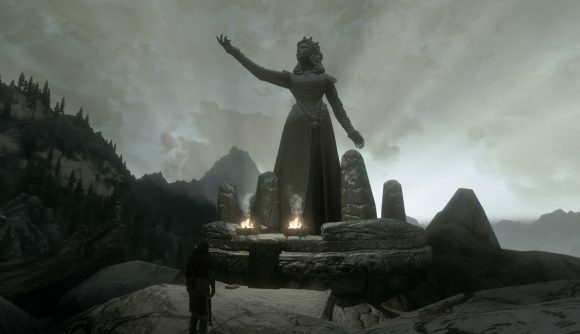 Wintersun – Faiths of Skyrim by EnaiSiaion adds new options and rewards for those who want to live in line with the Divines, the Daedra, or more obscure deities. You can raise your favour with your god of choice by using the Meditation power, praying at an appropriate shrine, or more generally following the tenets they’ve set forth. At a low level of favour you get a minor ability, while at the maximum level you get access to a much more powerful form of divine intervention. So if you were to worship, say, Talos, you’d gain favour by doing things like absorbing dragon souls and slaying Thalmor. Basic abilities will make your attacks and abilities more powerful against elves, while the power granted to top devotees will halve your shout cooldown whenever a nearby enemy dies. Naturally, the requirements and abilities can get much more esoteric or nefarious depending on who you’re worshipping. On top of the Divines and the Daedra, you’ve also got a host of racial and other deities to choose from drawn out of Elder Scrolls lore. Those range from the ancestral pantheon of the Khajiit to the Hist itself. And yes, Sithis is an option if you want to go really evil. Wintersun is available for both Skyrim and Skyrim Special Edition through Nexus Mods, so you’re covered no matter what version of the game you’re running. If you’re looking for more mods, there’s the vampire city of Coldhaven to check out and a full multiplayer mod getting ready for a beta debut. The mod community is apparently intent on keeping Skyrim alive well into the indeterminate future of TES6.